We both signed up that day and after attending Wing Chun classes for a month I started adding two privates a week onto my training schedule. 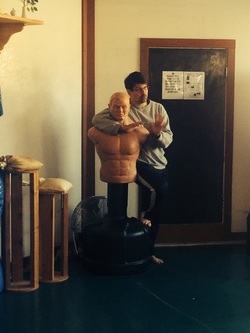 For the next several years training at Sifu Lam’s became the focus of my life. On the weekends I arrived at 8:00am and often left at 1:00pm; it was an environment that demanded self-discipline and a willingness to test what we were learning. I kept up that pace until 2004, when it became apparent I was making myself sick by over training. In my training with Sifu Lam I always did my best to engage him as much as possible with questions on theory and application, and in sessions of Chi Sau (random reflex training) to test my understanding. In meeting Sifu Lam I discovered Wing Chun was a direct path for learning about how the body’s angle and structural alignment provided enormous advantages in fighting. In reflecting on what I have learned about Wing Chun over the years, I find that Wing Chun is not what most people think of when they call something a martial art. Wing Chun has forms, drills and freestyle training; but what it doesn’t have, like other martial arts, are specific answers to direct questions about what to do in this situation or that. Wing Chun is a system of principles, structure, advice, experience and experimentation. It is not something that can be imitated or copied in a rote fashion or design, it demands that we learn it, digest it and then make it our own. This is why many teachers from the same Sifu often seem different. They learned the same material from their teacher but have their own unique experience and expression of what Wing Chun is. An example of applying principles in Wing Chun is hitting the head at the same point repeatedly (called chaining the attack) until the opponent is subdued; drawing from the idea that Wing Chun is a principle based skill set and not a collection of techniques, in any martial art when one combatant chains the attack to the head, that act of striking to the head is Wing Chun in essence (called attacking the General in Wing Chun). Wing Chun as a martial art refers to intelligent, tested and logical reactions that have a universal applicability to what’s practical in hand-to-hand combat. This principle of attacking the general (the head) is a common denominator to most striking systems for good reason, especially seen in the systems that suffer extensive and repeated testing (such as western Boxing). What gets used in real fighting, what there is time and opportunity to be able to do, usually is simple, direct and efficient. This is why it is said Wing Chun begins where other arts end. Wing Chun begins with the most useful and direct actions for fighting, no fancy or complex movements are taught. What one learns in Wing Chun is the same kinds of actions used by experienced street fighters. Wing Chun does not teach specific techniques to particular attacks; it deals in angles, distance, position, timing and opportunity. What or how you respond is not fixed and can change from encounter to encounter, but what never changes are the principles. Principles such as attacking the general, chasing the center (not the hands), keeping the hands on top, taking position, making the opponent’s angle wrong, chaining the attack and changing to re-attack, to name a few. Principles are what define Wing Chun; it is what is truly being trained when we learn it and practice. Perhaps the most unique quality of Wing Chun is the use of the elbows; traditionally referred to as fighting from the elbows. The elbow in Wing Chun is the demarcation point between the support system of the body for power, mobility and stability, to extending the arms forward along the center-line to attack and simultaneously deflect what ever gets in the way of hitting the target. The elbow also provides in-position angles of defense, protecting our own center-line, offering a wedge to whatever tries to land a blow on our center of mass. The body of Wing Chun is mobile, on balance and connected to the ground for power. The actions of Wing Chun take place in front of the elbow, with the structural support for whatever action comes into play being behind the elbow. Fixing the elbow position in front of your body for defense and power also has the added benefit of leaving the hands free to attack and defend forward to the opponent. With the hands already in place, timing improves and organizing the hands to cooperate in landing blows to the head and neck becomes much easier. Another interesting facet of Wing Chun design is that it is not adding artificial reactions and reflexes, but instead is a refinement of natural responses that react to a threat. Wing Chun takes what the body already knows about fighting and makes these reactions more stable, efficient and direct. It harnesses what is an instinctive reaction; so in essence everyone’s nervous system already understands Wing Chun fundamentally and all that is required is a training direction that allows a student to hone these innate reflexes into the most direct, efficient and logical responses possible. Forensic studies of people that have suffered violent attacks or accidents usually reveal that there was extensive damage to the parts of the hands and arms that were used instinctively to defend the head and neck from trauma. An observation of people in street fights and animals in the wild for that matter will reveal an instinct to get on top of the enemies hands and arms and attack the head and neck (attack the general, chase center and take position). Wing Chun is a refinement of survival instincts already present in our nervous systems. It is taking what we have used to defend ourselves as a species for thousands of years and making it as potent and direct as possible. Sifu Lam often says that there are no true secrets in Wing Chun, but that everybody must “go by the same road” in their training and experience; I suppose the trick is staying on that road over a life time. The only real secret I have ever found to be true in martial arts training is hard work, a consistent and diligent effort. Hard work is the meaning of Kung Fu, hard work over time in the pursuit of excellence. Sifu would say it all depends on what you want, and if you are crazy for Wing Chun then making it your own is inevitable. Sifu Lam often tells stories about long hours of training with his teacher Wong Shun Leung, being at Sigung’s school 4-5 days a week, and training until late at night. There are no short cuts in learning Wing Chun; in my experience it has meant sacrifice and determination. Studying Wing Chun does have the advantage of reducing the time it takes to become proficient in the martial arts; Wing Chun spends no time developing flowery actions that look good but have little value in reality. Wing Chun trains what works and what works is always simple, direct and efficient. These are some of the ideas I have about Wing Chun and training; I will add to this collection as my Wing Chun muse moves me.